WHY can’t hospitals communicate?? Today I got upset over the fact I might have to have a camera down my throat to take the PEG out but the dietican has told me that wont happen. Why cant they just tell me the right thing thats gona go on when I have this PEG changed. Its giving me sleepless night over the worry of might what happen. I want this PEG thing over with now really, and I can think about getting out and about again and going back to volunteering. But thankfully when mum called the dietican up at Newcastle and she said I wont be having the camera down my throat and I can choose my own PEG. How pathetic am i getting upset over it eh? I’ve been feeling somewhat out of it the last week or so… like somethings different and I don’t like it. I’m not doing much at the moment and im lying in late every day, probably coz I don’t see the point in getting up sometimes because the days just gona be the same again. Hopefully after the PEG change has been done and I’ve recovered from it, I can go back to volunteering at the school. For now I have a tapestry to do which wont keep me buy for long because its only small but I shall just have to buy more off ebay if i can find any! I have finally got the date for the PEG procedure. FINALLY! It’s on 20th October so i don’t have too long to wait. We will have to arrange to stay over the day before in Newcastle in case we need to be there early. Last appointment we had to be there for an morning appointment and with a 3hr journey ahead of us, we had to get up at 6am and feeling crap! So now we know what to expect on a time frame, we want to be nice and fresh for the procedure. I’m not big on idea of the local anesthetic but if thats what I gotta do to have a tube free belly then I’ll have to put up with that stinging pain of a needle! I just hope time goes by fast and I can get it out the way and dont have to worry about the PEG getting in the way of anything again! just gotta hope it all goes well with the next button peg turns out to be better than the tube I have at the moment. It will be more easy on the eye and the tube won’t get in the way again which I am pleased about. hopefully the appointment will be ASAP and I don’t have to worry about it as much. The only fustrating thing is I cant bloody find a thing about the microvasive button that im going to have anywhere on the net! It would be nice to know what to expect! I got some leaflets from Newcastle about the PEGS i.e the one I have at the moment and the one I plan to get so I’ve been reading through them today. It all seems normal to me to be reading these things about things I;ve aready been doing with my PEG. We are getting somewhere with the peg situation! Mum has been talking endlessly to Newcastle nurses since Huddersfield or Halifiax dont do the button peg procedure (dont ask why) I was going to have it done at Bradford since it was closer than Newcastle but when my mum talked to the nurse at Bradford, and the nurse there was like “why does she want the button peg? and talking about the fact that PEGS can stay in for 9 yrs!” which is untrue. I want the button peg because im 24 years old, why should i have to live with a tube hanging out my stomach when I don’t have to? We thought she didnt have a clue what she was talking about so we decided to go to Newcastle where they know me and my condtiition well and I have it done in 4 weeks as a day case. I feel reaasured at Newcastle that they look after me well, although i wish i could say the same for bradford. No one seems to communicate there and im passed around like a bloody plate of food! it’s not a nice feeling. Im grateful for bradford hospital for giving me the cochlear implant but every other time ive been in there it’s been a disaster such as my landing in intensive care for 5 weeks because a nurse told me I could eat food when I shouldn’t have. At least I dont have long to wait long now and I can get my PEG and the infection sortedout. The nurse at Newcastle told us that the infection is due to having the PEG tube in too long as the inside piece under the skin of my stomach can crumble. I found out when i was researching PEGS online yesterday that any long term PEGs should be changed every 8 months, so we are asking questions about why no one is keeping an eye on me and the PEG situation. why am I not getting looked after properly by the NHS? why am I not getting the proper aftercare after my PEG operation, etc check ups? why did i not get my PEG changed after 8 months as rules say? why do my NHS hospitals always wait til the worse senario before finaly doing something about it?? Now i have an infection with bad skin round my PEG which i have had for weeks because no one has been keeping an close eye on my PEG situation. which makes me so mad that I have to go through this pain in my PEG coz the NHS doesnt have the proper facilities to look after a bloody PEG?? My mum has been looking after it for me, if she can do it, why isn’t there any one proffessional out there to do it to keep an eye on it if there maybe an infection on the way? I have a lot of Qs and no ones giving me answers?! its got me cheesed off that I should’t have got this infection if someone was keeping an eye on my PEG and making sure everything is ok with it! How rubbish is it that I’ve not really seen a PEG nurse in the 2 yrs when I first got my PEG and then nothing til i started getting my infections! I am angry and i want answers! After a crap week of downness due to the death of Grandma and my bad PEG, I could have done with some cheering up and thats what I got when the boyfriend came up for the weekend 🙂 We went to the Cochlear implant meet up and a lovely BBQ at one of my family friend’s house! We went to the cochlear implant meet up of families at a Huddersfield pub. Although, only 2 other families made it to the meet apart from myself and the family that organized the meet up but we had a good after noon of sharing views and opinions of cochlear implants. We had hoped more would come but with issues with trains and short space of time to organize it were factors but we got to meet 3 lovely families out of it! Hopefully there will be more at the next one that we plan to do next year which give us more time to plan it and more time for people to organize to get there if they can. The PEG has settled down at bit, I’m still using these silver patches on it which makes it sore but apart from that, it’s better than it was! I am also hoping the “button” PEG procedure will be soon too. I’m still waiting for a date on that. I’ve also been doing some boing exercise on the Wii yet again to try and built some muscle on me, it might be a lost cause though what with having a muscle condition…! But it’s worth a try! I have since got silver patches from the nurse for my PEG to get it better, it’s a bit sore and stingy but I’ve had to take painkillers for that. Last night I was up most of the night unable to sleep, and i’ve had to be up early for the funeral of my grandma so ill be getting some sleep tonight! I hope! I am also looking forward to the C.I meetup in Yoriskhire this saturday! will be good to meet others with Cochlear implants and get to know their experiences and meet in person! On my first note, I want to say RIP to my grandma, who sadly passed away on 1st september. My parents are busy with funeral details and the funeral is on Tuesday. I’m glad she went peacefully after a battle against stomach cancer and in a hospice rather than hospital which no one would have been aorund her. 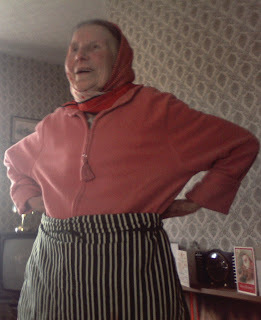 I like this pic of her because it;s how she was at home with her headscarf on and she looks all cheery! On my medical note, my peg is looking better after having some dressings and special cream on my peg site. It could look even better after some more dressings i guess, and faltten that wart type ball that was growing out of my PEG site. I spent the night being woken up by my parents and my brother because the feed pump kept beeping! I had enough of it by 3am and told them to just turn it off! Only to be woken up early by mum in the morning because the nurse was due to come so I got nooooooooo sleep whatsoever! I am still waiting for a date for my “button” peg procedure which might be a couple of weeks. Apart from that just lots of flopping about!